You know they’re nutritious but that’s not enough to get your kids to eat those greens! While a straight up side of veggies might start a dinnertime disagreement, incorporating them right into the foods your kids already love makes it easier to get more veggies in without a fight. Here are 3 tips to make it easier and more fun to eat greens! It’s a lot of work to chew a large floret of broccoli or a leaf of kale, so why not serve it in an easier to chew form? This tip is perfect for broccoli, cauliflower, chard or kale to name a few. Just choose a grain like Israeli cous cous, rice, or quinoa, add a little more water than the recipe calls for, and while the grain is boiling, add in your veggies which you’ve chopped into very small pieces. They will meld in with the grains and if you include a cheesy sauce, they’ll be asking for seconds! Finger foods are way more fun than food you have to eat with a fork. Think lettuce wraps instead of a salad. If they get to make “tacos” with a lettuce shell and their favorite fillings, they will be much more inclined to eat those greens. Here’s a link for some delicious Thai Lettuce Wraps. Sweeten it up in a smoothie! 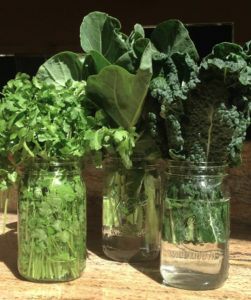 This is a great way to get raw leafy greens into the mix! Make up a fun name (like superman juice) and make it sweet with healthy fruits. My favorite green to use in smoothies is spinach because it has a mild flavor and kale is another good one. You can use frozen berries, bananas, tropical fruits or whatever seasonal fresh fruits you have on hand. I like to use vanilla almond milk or orange juice as the base and add a little bit of ice.